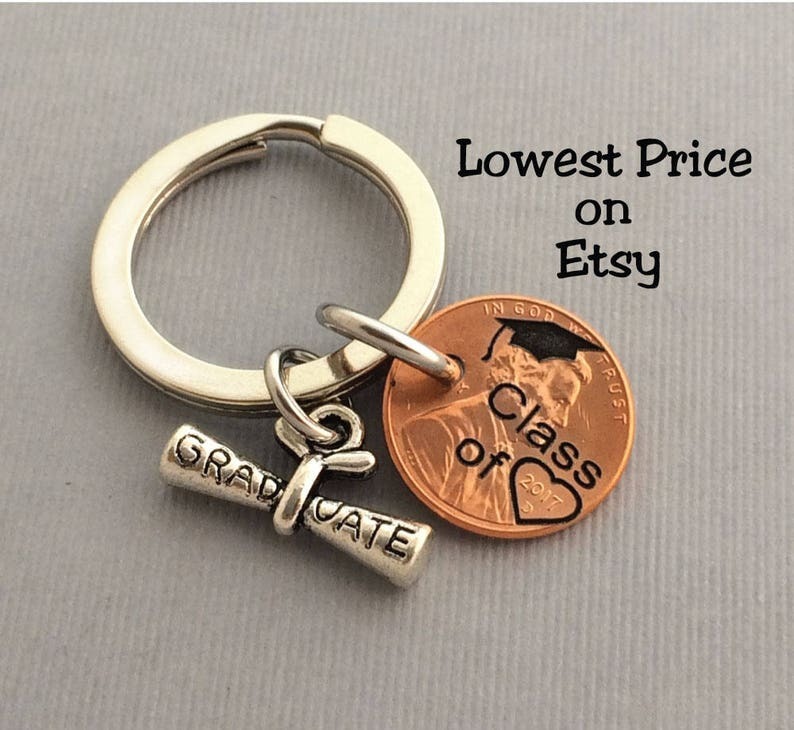 This keychain comes with the words engraved on the penny "Class of" then we engrave a heart around the year on the penny. From the drop menu choose the year that you would like us to engrave a heart around. We also engrave a cap on the head and it also comes with a charm that says "graduate"
Great craftsmanship and service. Item is great. This will make a wonderful graduation gift addition. Great buying experience and shipping. Shipped quickly and looked just as described. Thank you! invoice, you can print an invoice from your purchases made on Etsy. Please note that an administrative fee will apply, the fee is 10% for cancellations or returns. Refunds on cancelled orders could take up to a week to process. Engraved items and Jewelry items are non-refundable, non-returnable as they are made for each order, however if there is an error in the jewelry that I have made, I will fix the mistake immediately and re-send the piece within the first 2 weeks of delivery. We cannot do partial refunds do to not receiving in time. Material: The Charms and chains come in 2 finishes: Gold- plated, and Silver- plated. If you have sensitive skin, wearing solid gold or sterling silver is advised and not the plated materials. Caring for your plated Jewelry: To extend the life of your jewelry, remove the jewelry when sleeping, exercising or any other physical activities. Sweating can cause the plating to wear or tarnish. Make sure to remove the necklace when swimming, or showering. Avoid contact with lotions, perfumes, chemicals and never use jewelry cleaners or jewelry polish cloths to clean your jewelry as this will wear off the plating. For light cleaning use a soft lint-free cloth and gently polish the necklace as this will help avoid scratches and wearing away the plating. Make sure to store the necklace in a cool dry place. We normally ship within a week after the order has been placed. Once your order has shipped through USPS, it is out of our control if your package never arrives. Please check with your neighbors to see if they received the package in error or check with your local USPS to further assist you. **INTERNATIONAL ORDERS** Please note that orders shipping international can take up to 2 months to arrive depending on where you are located. Once your package leaves the USA we are not responsible for lost or missing/stolen packages. Please check with your local post office. If orders of a larger quantity are wanted we can give you a better price.